From Here to There: Много хубава църква! Saturday was a very pleasant day. Laura and I walked around the town looking at license plates and finding the Starbucks. Laura is obsessed with license plates, and maybe got me hooked on the hobby. I will report back if I can find all of the countries in Europe while living in Sofia... wish me luck! The coffee was great at Starbucks. I do love an iced Americano. However, here in Bulgaria they usually drink little shots of espresso. This is also fine with me, and saves a decent amount of money. 75 cents for your morning cup of coffee? We wandered around through a park, and saw some old men playing chess. Their game was really intriguing, and they would make their next move so quickly! I can't even beat my computer. Then again, I think that whenever I'm on my computer Steve Jobs is out there somewhere battling it out... Anyways, their game was great, but then the guy on the left started to talk to us about something. We obviously couldn't follow very much of what he had to say, but it could probably be summarized into "Oh, you kids these days." 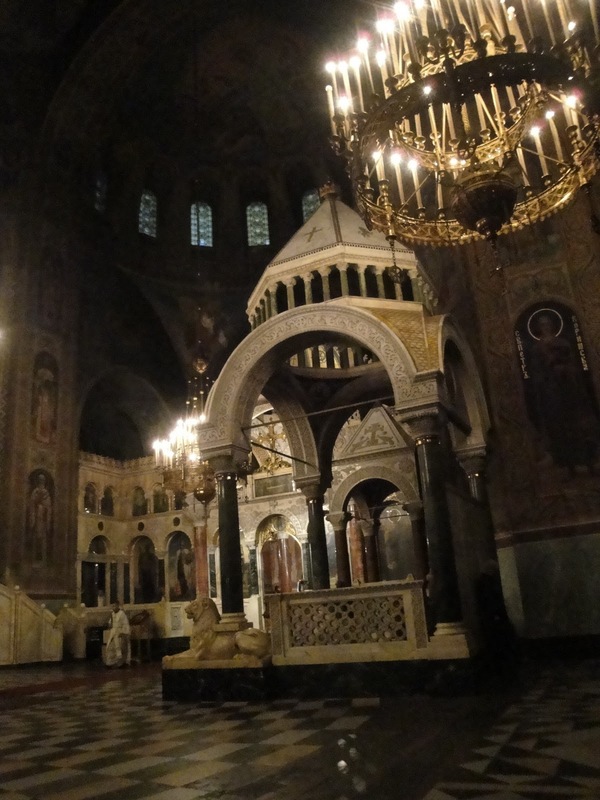 We continued our walk to the most remarkable building in Sofia: the Alexander Nevski memorial church. It honors the 200,000 Russian soldiers who died during the War of Liberation from 1877-1878. The exterior is gorgeous, with huge domes and half-domes, four of which are plated with gold. 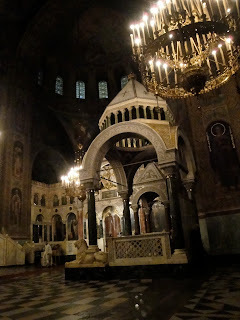 The inside is also gorgeous, with huge frescoes and beautiful chandeliers. It was dark when we entered, so we didn't get to see much. Only near the end did of the service did the lighting increase enough for a picture to show up. But the best part was certainly the service. We were lucky enough to walk in during a service with a full choir. It was so peaceful to just sit inside and listen, and watch all that was going on. This video's quality isn't the best, but the sound is glorious. After our long walk, we went out for a nice Bulgarian dinner. I enjoyed a shopska salata with fried cheese. You need to mix the good with the bad. Did you tell your friend Laura about the time John and I went with David and Chris to workcamp in Vermont. I told Kami Kost I would give her 20 dollars if she saw all the US plates on the trip. So did, even Hawaii!!! I had to pay her. What are the chess players doing when they hit that brick after each move?